. : Super Paper Mario :. Home / Nintendo Wii game manuals / Super Paper Mario :. Super Paper Mario manual Just click to open it in a new window then print the manual. While Mario's proper 3D Wii adventure is still a ways off, Nintendo and developer Intelligent Systems have cooked up an engaging adventure to tide the plumber's fans over--Super Paper Mario. 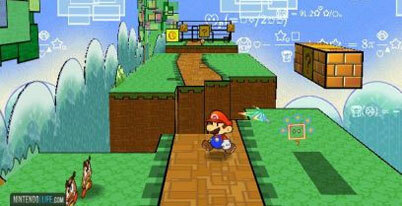 Although originally slated to be a GameCube release, Super Paper Mario has been shifted to the Wii to good effect. The unique game is a hybrid of platforming and role-playing that feels both new and familiar at the same time. The game has many of the aesthetics of the previous Paper Mario games and features an inventive story, eccentric characters, rock-solid gameplay, and genuinely funny dialogue. While the whole package isn't quite refined enough to attain classic status, Super Paper Mario is still a great game that stands among the Wii's best.